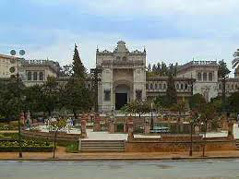 The Archaeological Museum of Seville is located in front of the Arts and Popular Customs Museum (old Mudejar Pavilion) and next to the Royal Pavilion, all in the Plaza of America (popularly known as “Plaza de las Palomas”), located as well in the Park of Maria Luisa. The building was destined to be the Fine Arts Palace in the Latin American Exhibition of 1929. It was projected by Aníbal González and built between 1910 and 1915 in a Neon-Renaissance style. The archaeological collections are transferred to the building in 1942, before they were in the old Convent of la Merced, building that lodges the Fine Arts Museum of Seville.